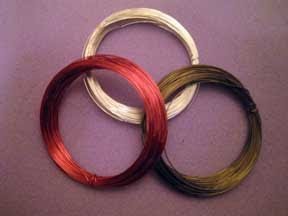 I enrolled on a class at adult education before Christmas called WIRE AND BEAD WORK it started on Friday, it is for 2 hour and runs for 10 weeks, I do alot of bead weaving but this is something different a new technique to learn as you can see below I have 3 coils of wire to be combined with some beads, it is going to turn into a necklace which will be finished in class next week. I was going to take my Xmas cards to be recycled, then I had an ideal how I could recycle the fronts of the cards, I have turned them into thread tags they are blank on the back so I can write the thread numbers on the back. 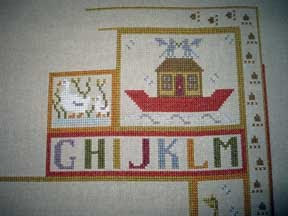 I have done quit alot on my birth sampler I have managed to complete most of the upper right hand corner of the chart as I have not stitched anything else. Oh what a great idea for cards wish I had thought of that one-try to remember next year. That birth sampler is going to be so cute! Love your blog!! 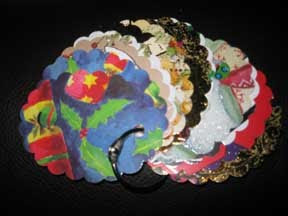 What a great idea for recycling Christmas Cards, I'm going to try that one.